Sony has started sending out emails to owners of the Sony DPT-RP1 with details about a new upcoming firmware update. They’re also going to be releasing new mobile apps for Android and iOS to transfer files to and from the Digital Paper device without having to use a computer. The firmware update will be available to download starting May 30th, and the mobile apps are getting released in June. 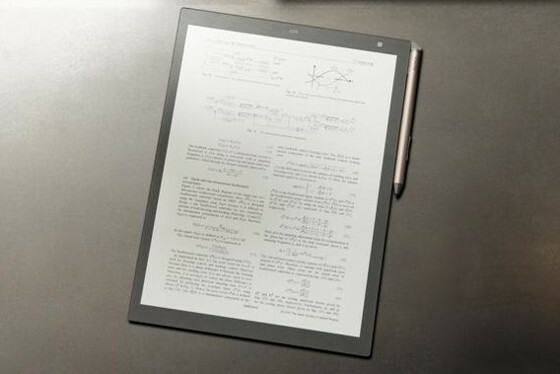 Sony has a new smaller 10.3-inch model, the Sony DPT-CP1, coming out next month so this update was expected since they’ll both be running the same software. The RP1 was released 1 year ago next month so it’s about time Sony came out with an update, especially considering the lack of some common features. Unfortunately the update still doesn’t add table of contents support, but they did add some helpful features, and I think a lot of people will appreciate the mobile apps, not being tethered to a computer to transfer files. May 30th has come and gone, so where’s the elusive firmware update? I hope it’s more than just good intentions by Sony. That is a bummer. What I don’t get is the last thing on the list, which is copied straight from the email. The device already had 16-page view so what are they even talking about. Plus they say document, book or article as if it supports more than just PDFs. Makes no sense. None of those features are useful. What a complete joke. I’m glad I never ended up buying one. They made an ANDROID app for file transfer but won’t make a native app on the device itself?? Ridiculous. A contribution from an owner of c.6 months. The device has been a valuable addition. Though there is limited functionality I argue that this comes with inherent advantages (along with some disadvantages). From a hardware point of view this device works well in sunlight and a very well (evenly) lit indoor space, it does, however, become problematic with anything but a high standard of indoor lighting vis a vis contrast issues and reflection issues. The new firmware is on the whole is a welcome modification. Of the changes that *have* been made I’d rather the auto-rotation feature was optional. There are a limited number of changes to the menu interface. Otherwise the changes are useful. I (subjectively and tentatively) believe there have been performance improvements, this mostly lies within navigating a document. In addition it would, so far, appear that two rendering issues have been resolved. 1. The low resolution rendering of graphical content under certain conditions and 2. Problematic rendering of certain pdf files (where the kerning of fonts appears to become derranged). I write this as advice to anyone contemplating the firmware update but are cautious to do so. This update (1.4.01.16100) appears to be innocuous and probably helpful. And you, sir, should be arguing before the Supreme Court.